Kebab Hut uses their own specialised couriers to deliver their food. 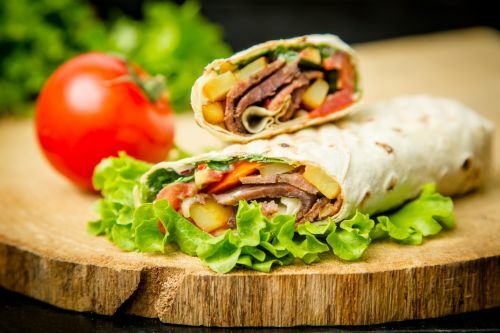 All kebabs served with choice of salads and sauces. Marinated chicken off the spit. Wrapped in toasted pita bread. Served with lettuce, tomato, red onions & house garlic sauce. Deep fried falafel balls. Wrapped in toasted pita bread. Served with lettuce, tomato, red onions & house garlic sauce. Marinated lamb off the spit. Wrapped in toasted pita bread. Served with lettuce, tomato, red onions & house garlic sauce. Marinated chicken & lamb off the spit. Wrapped in toasted pita bread. Served with lettuce, tomato, red onions & house garlic sauce. Succulent pieces of marinated chicken, grilled to perfection. Wrapped in toasted pita bread. Served with lettuce, tomato, red onions & house garlic sauce. Succulent pieces of marinated lamb, grilled to perfection. Wrapped in toasted pita bread. Served with lettuce, tomato, red onions & house garlic sauce. Marinated lamb mince, grilled to perfection. Wrapped in toasted pita bread. Served with lettuce, tomato, red onions & house garlic sauce. All Platters served with salad, rice, and your choice of any Dips and Turkish bread. Marinated chicken off the spit. Served with salad, rice, Turkish bread & choice of any two dips. Marinated lamb off the spit. Served with salad, rice, turkish bread & choice of any two dips. Deep fried falafel balls. Served with salad, rice, turkish bread & choice of any two dips. Marinated chicken & lamb off the spit. Served with salad, rice, turkish bread & choice of any two dips. Succulent pieces of marinated chicken, grilled to perfection. Served with salad, rice, turkish bread & choice of any two dips. Succulent pieces of marinated lamb, grilled to perfection. Served with salad, rice, turkish bread & choice of any two dips. Marinated lamb mince, grilled to perfection. Served with salad, rice, turkish bread & choice of anytwo dips. Succulent pieces of marinated chicken, lamb & lamb Mince, grilled to perfection. Served with salad, rice, Turkish bread & choice of any two dips. Box of freshly fried potatoes. Box of freshly fried potatoes with melted cheese. Box of Freshly fried potatoes with melted cheese, a layer of chilli paste & jalapenos. Freshly fried potatoes with hot gravy. Fried fish petty, cheese and tartar sauce in a brioche bun. Fried veggie petty, cheese, mushrooms, red onions, chilli and mayo sauce in a brioche bun. Juicy beef patty, red onions, pickles, cheese, mustard and tomato sauce in a brioche bun. Grilled Beef petty, cheese, red onions, tomatoes, BBQ and tomato sauce in a brioche bun. Fried chicken petty, lettuce, cheese, tomatoes, pineapple and sweet chilli sauce in a brioche bun. Double beef petty, double cheese, lettuce, red onions, jalapenos and chilli paste in a brioche bun. Served with lamb on hot chips and sauces. Served with chicken on hot chips and sauces. Served with mix meat on hot chips and sauces. Served with fried falafels on hot chips & sauces. Deep fried flake in a toasted pita bread. Served with lettuce, tomato & tartar sauce. Deep fried flake on hot chips with tartar sauce. "ALCOHOL DELIVERY BETWEEN 12NN - 11PM." Liquor must not be supplied or delivered to a person under the age of 18 years. The licensee must ensure that its delivery staffcomply with the relevant provisions regarding the supply of liquor to minors. The quantity of liquor delivered as part of a home-delivery meal service must not exceed more than one 750 ml bottle of wine or six containers (not more than 375 ml per container) of beer or pre-mixed spirits per delivery.